GE® ENERGY STAR® 18.1 cu. 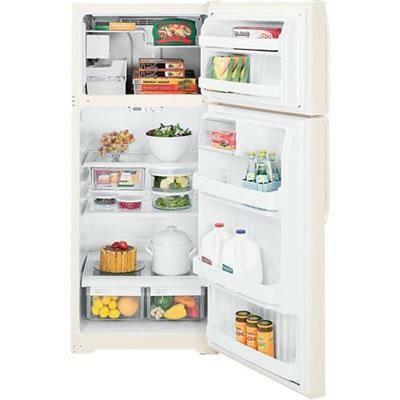 ft. top-freezer refrigerator features adjustable spill-resistant glass shelves and factory-installed icemaker. Technologies Frost Free; Deluxe Quiet Design; Easily Removable Door Gaskets; NeverClean Condenser; Most Energy Efficient; America at Work: Product Assembled in the U.S.A.
Additional Information Temperature Management Features: Air Tower; Control Type: Upfront Temperature Controls; Icemaker: Factory-Installed; Fresh Food Cabinet Shelves: 2 Total - Glass, 2 Adjustable, 2 Full-Width, Spill-Resistant; Fresh Food Door Shelves: 3 Fixed (2 with Gallon Door Storage); Fresh Food Cabinet Drawers: 3 Total Clear, 2 Adjustable Humidity Drawers; Fresh Food Features: Interior Lighting - Single Level; Freezer Cabinet Shelves: Step Shelf; Freezer Door Shelves: 2 Fixed; Freezer Features: Ice Bucket; Leveling System: 2 Point Front Adjustable; Door Stops; Door Swing: Reversible Hinges; Coil-Free Back; Cabinet & Door Liner: ABS. 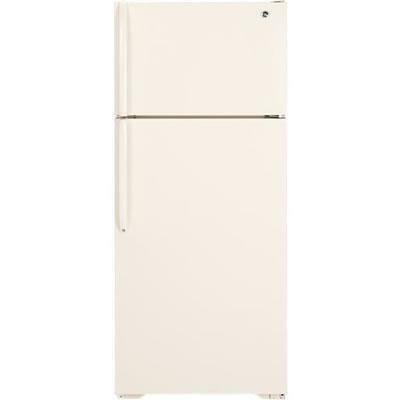 Additional Dimensions Overall Depth: 32 3/8 in; Case Depth Without Door: 26 3/4 in; Depth with Door Open 90°: 56 3/8 in; Height to Mid-Freezer: 57 in; Height to Top of Case: 66 7/8 in; Width w/Door Open 90 Degrees Incl. Handle: 30 3/4 in; Width w/Door Open 90 Degrees Less Handle: 28 7/8 in; Back Air Clearances: 2 in; Side Air Clearances: 0 3/4 in; Top Air Clearances: 1 in.